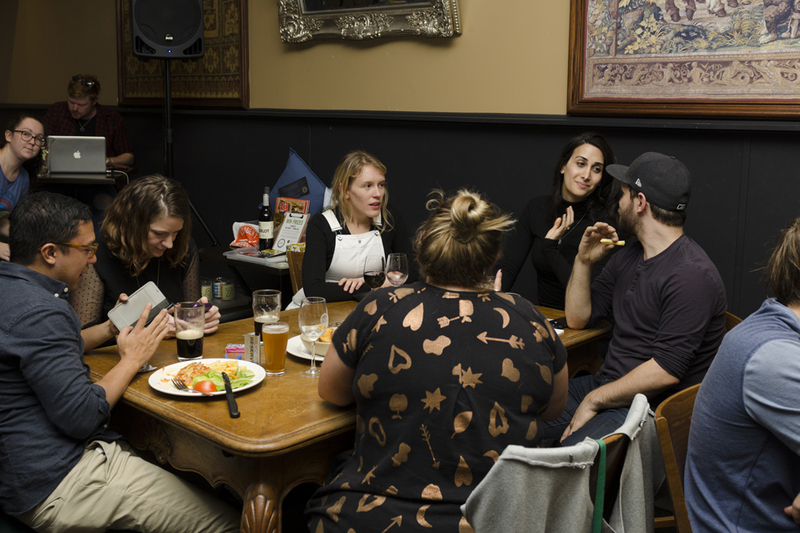 Student Conservators at Melbourne (SC@M) and Student Conservators for Timor-Leste (SCTL) hosted their first joint 2018 event – a Trivia Night fundraiser for the Asylum Seeker Resource Centre (ASRC). The night was a huge success, with over $850 raised! Whipped up over a couple of short weeks, prizes were sourced plus games and questions figured out. Our lovely hostess with the mostess Tina was booked with just enough time to prepare her stunning outfits (luckily she was available, being a busy b-grade actress and all). The evening went off without a hitch. This wasn’t a traditional trivia night where you just simply answer questions to get points. Here we embraced bribes, which became the main player, in order for the six teams to win. Teams were given the initial task to come up with a team name, which was given to the Clyde bar staff to judge – their favourite Kiss My Acetone won free snacks. Over each round every team was able to approach the stage and pay for a hint from the host or bribe the judge to go easy on them when the answers were being collected. Four mini games were played each with their own respective prize. The first was Heads and Tails, won by Juanita who bagged a free jug of beer for her team. Both Lily and Dan won the second game, Coin Toss, and left with a free jug of beer and a bottle of wine. Next was the always disgraceful Donut Eating Competition, where Dan smashed his opposition by demolishing his donut without using his hands, winning yet another jug of beer for himself and his team. The final game was simple, impersonate a chicken on stage for a last ditch attempt at winning 10 points. It ended in a tie between second year student conservator Nick and first year student conservator Dan who split the points evenly for their teams. In the end there was one point separating the first and second teams – if it weren’t for the huge amount of bribes the winning team gave they would have been beaten. So congratulations to...I can’t believe I’m about to write this...Chris Is A Poo Bum Face for narrowly beating the (much smarter) runners-up Kiss My Acetone. The major raffle prize pack was won by Mar, the second raffle prize pack won by Ant, and the door prize went to Heather. Congratulations to all the winners, and a huge thank you to everyone who participated and dug deep to donate to the ASRC, a brilliant organisation. Keep up the good work team! We hope to see you soon at the next SC@M event, brought to you by your Friendly Neighbourhood SC@M Events Officer (moi). 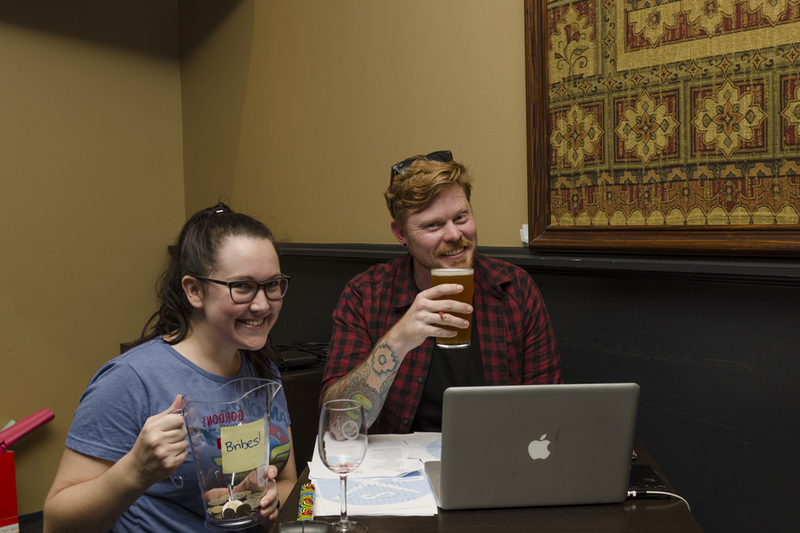 Big thanks to Trivia Night major sponsor The Clyde Hotel, and to our major supporters Escape The Vault and Sun Theatre Yarraville who donated fantastic prizes. SC@M and SCTL are supported by the GSA (University of Melbourne).